http://cinziamazzamakeup.com/?x=acquistare-levitra-consegna-rapida I failed to mention while posting the asparagus soup a couple days ago, that the main reason Sharon asked for the recipe was because asparagus is a smoking deal at Bashas’ grocery stores this week. Gorgeous pencil thin bunches for .99 a pound! You only have today and tomorrow to run out and pick it up before the sale ends… hurry – grab your keys and leave now – get it before it’s gone! 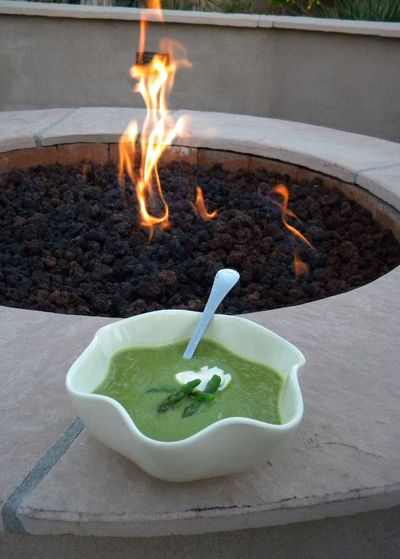 And in case you are like me, and can’t let a good deal pass you by and you pick up a couple more pounds than needed for the soup… here’s another healthy recipe using asparagus. http://maientertainmentlaw.com/?search=guaranteed-cheapest-viagra There’s nothing like a little salt with your chocolate, the flavor combination is irresistible, no wonder peanut M&Ms are a snacking favorite. 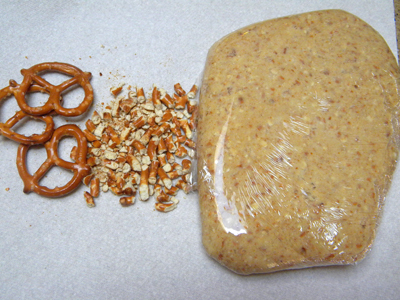 The pretzels can be difficult to make into crumbs for this crust, but not to worry, the mixer will do the finishing work for you. Be sure to use the pulse button of your food processor to coarsely chop the pretzels, otherwise you’ll just have a pile of fine crumbs. Then when you add them to the butter and powdered sugar in the mixer, and let it go to town, they’ll end up being the perfect consistency. Picture proof below! Valentine’s Day is only 2 weeks away. This is a special little something you might like to consider making for the sweethearts in your life. 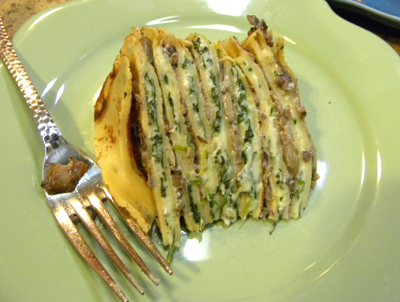 One of my most loyal and longest followers requested this recipe by email. Sharon C. has children who attend LPG every summer and she and her daughter, (along with another mother/daughter duo who are their BFF’s) always leave lovely comments, which I appreciate immensely! So this is my shout-out to Sharon and Sydney C. & Debbie and Kelsey Q! Thank you, and I hope to see you again this summer! 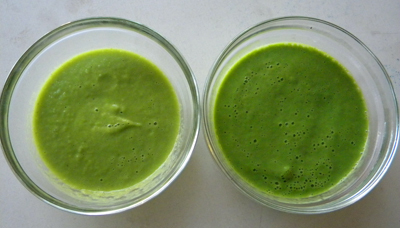 go here Tip: One of the downsides to asparagus soup can be the color. 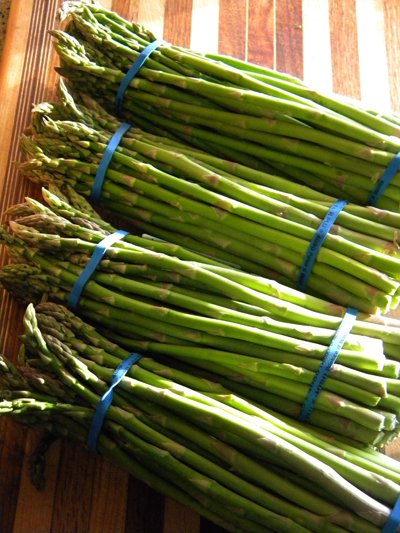 When asparagus gets cooked this long to make it soft enough to puree, it fades a bit. The solution? Add a few handfuls of fresh spinach to the pot a minute before blending. 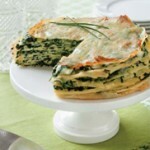 The spinach will not be noticeable in the taste, but will boost the color by leaps and bounds. My mother-in-law was born and raised in Madison, Wisconsin and is a life-long Green Bay Packers fan. She arrives next week, on Super Bowl Sunday, for a visit. I think I’ll freeze some of this lovely green soup and serve it while we watch “The Pack” bring home the Vince Lombardi Trophy! I haven’t had the opportunity to cook at home much this week. In fact, Monday, Tuesday, and Wednesday nights, I wasn’t even home. There were plenty of leftovers in the fridge for Dave and Marissa to help themselves to, but did they? No! Instead they just picked at stuff, never going to the trouble to even re-heat something and eat a real meal. I’m talking cheese and crackers for dinner. So when I finally was home to make dinner on Thursday night, it was up to me to use the leftovers. 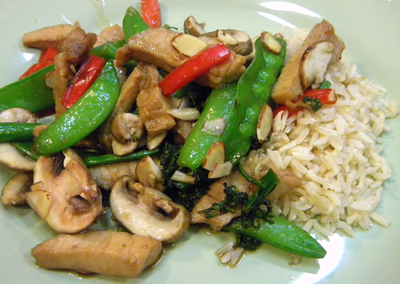 I made this stir-fry, using the Spanish pork from earlier in the week. That’s one of the great things about stir-fry, as long as you have nice fresh veggies, you can start with raw or cooked meat and end up with great results. Marissa hasn’t been feeling quite right lately, so she is self-diagnosing and trying to go gluten free for a week. Oh well, what can a mother do? The one thing this mom can do is help with food prep. 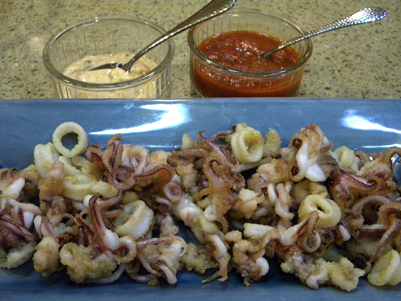 Along those lines, we made this calamari recipe with rice flour instead of all-purpose flour. It tasted fine, but the rice flour doesn’t stick quite as well as wheat flour, which left the calamari a bit less crispy than we like, but still plenty tasty. 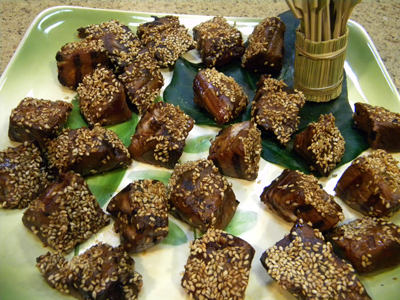 I’m making these quick and easy appetizers for our neighborhood Bunco tonight. I know I’ve said it before, but I have the best neighbors and the most fun neighborhood! We are very blessed! 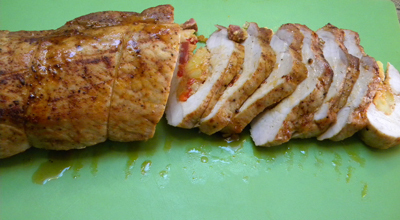 I’ve taken four of my favorite Spanish ingredients and stuffed them into a pork loin, creating a perfect Sunday supper. I believe you could take Spanish dry-cured chorizo, piquillo pepper, Marcona almonds, and smoked paprika and make just about anything more wonderful than it was before! Once you taste these unique candied pecans, you’ll be making them over and over again. And although you will be tempted to make a double or triple batch, it is best to make 1 cup at a time. Immediately as they are coming out of the oven, you need to get them onto a sheet of foil and separate them carefully and quickly, or you’ll have one big ball of pecans that will have to be chopped to get apart. Yes, they would still taste delish, but they don’t look so nice when they aren’t individual pecan halves. So avoid that temptation, because unless you’re a Tanzanian Devil, you just can’t move that fast! Once again you are getting two recipes for the price of one! 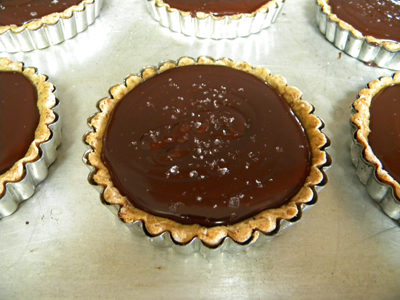 When you remove the pecans from the oven, there will be small pools of caramel left on the foil. They will harden and dry quickly. Once they are cool enough to handle, peel them off the foil and save. 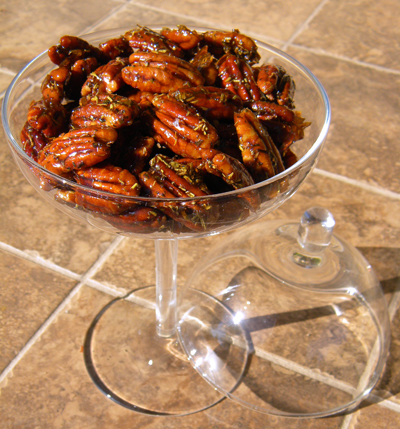 You can use them to make a fabulous vinaigrette, which you can use for a wonderful salad, with or without the pecans. 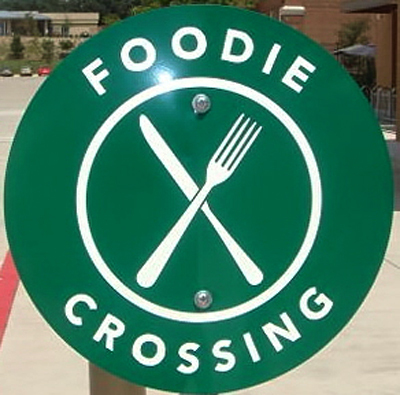 Did you see the article posted last week on The Daily Meal website listing the 50 most powerful food folks in America. CLICK HERE for a slide show (pictures are always a good thing!) and CLICK HERE for the full article. At least they got #1 right! A gâteau (pronounced ga-toe) is a French cake, often specifically a sponge cake. 1. a rich or fancy cake. 2. food baked or served in the form of a cake. An alternative smoked salmon gâteau (much quicker and easier) is at the bottom of the post. Either version makes a perfect light dinner, lunch, or brunch dish.